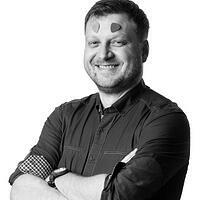 Tomasz Grynkiewicz, Senior Editor at Netguru: It seems that it’s come full circle. Having endured years of copying, now China is the place that one the largest consulting companies is advising to turn our eyes to. 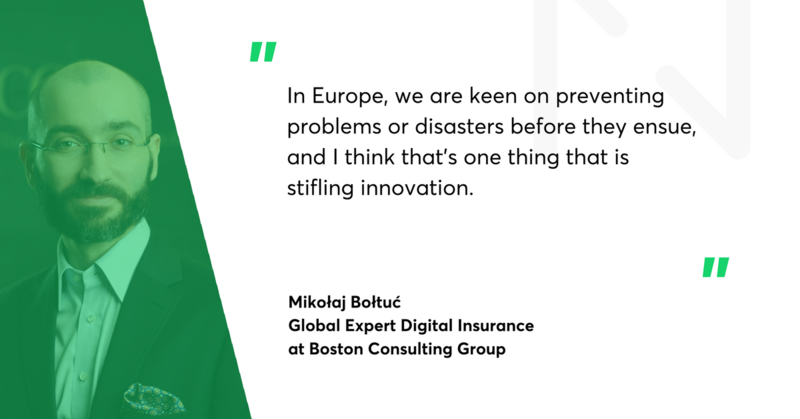 Mikołaj Bołtuć, Global Expert Digital Insurance at BCG: There is a reason. Chinese companies didn’t create a technology from scratch. Nor they invested as much as their Western counterparts in technology. Yet they are flourishing in tech. Why? Because they invested a lot in leveraging existing technologies and bet their growth on business model innovations. Take blockchain. There is no coincidence that Chinese insurers are the first in the world to actually use blockchain on a day-to-day basis. This particular technology functions quite well in China to allow the transfer of legitimate data and patient files between doctors and insurers. In comparison, U.S. companies and Western companies don't use blockchain, even though it was invented in the West. I think in the Western world, blockchain is still perceived by many not as a real-deal but rather as a solution looking for a problem to solve. But blockchain is just one piece of the bigger picture. Take services like WeChat. Instant messaging tools had existed for a long time, but in China, they became incredibly advanced. Agents in Ping An (one of the largest Chinese insurers) have worked together with WeChat to integrate their CRM features into the chat app. As for customers, they had the chat integrated with their favourite shopping portals. And one of the most eye-opening cases is the one of Zhong An – a joint venture between two apparent competitors (Tencent and Alibaba) and Ping An. It's extremely powerful because Tencent and Alibaba hold about 80 percent of the e-commerce market and Ping An is the biggest traditional incumbent insurer. Zhong An specialises in serving digital clients, and it's one of the fastest growing insurers in China. While looking for clues to crack down the Chinese code, where should we look? 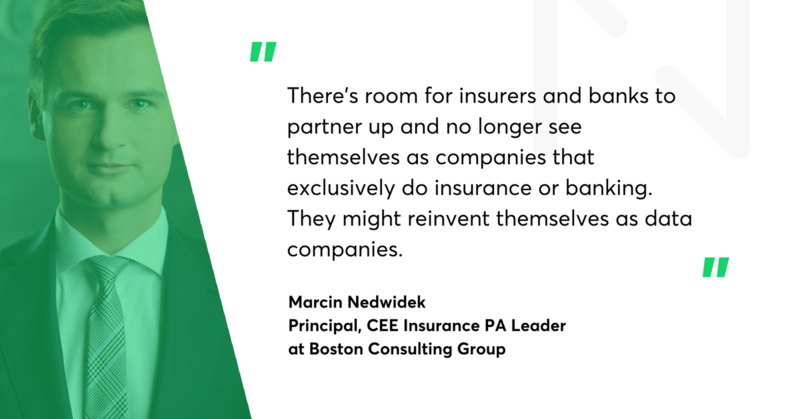 Marcin Nedwidek, Principal, CEE Insurance PA Leader: I think it's important to look at the Chinese market environment, which allows these kinds of innovations. China has some of the biggest e-commerce markets in the world, the sheer scale is huge, and Chinese companies have long leveraged the existing technologies for e-commerce. The e-commerce market in China has built trust. It allowed regulators to see that payments in e-commerce can be safe, and that the whole industry lends itself to the very interesting digital environment. On top of that, Chinese consumers spend three hours a day on average on their mobile phones and we are seeing that the financial market in China has shifted to mobile, has shifted to the internet market. Western countries are still a little lagging behind, because consumers here are yet not as digitised. But we're going in that direction. You mentioned the Zhong An. I’m having a hard time imagining that kind of venture in the European market. Zhong An reaches out and completely transforms the customer journey in insurance purchases. You purchase something on Alibaba and Zhong An offers that they will insure both the product and the shipping in an instant. Additionally, let’s say that you bought a suitcase – you will see an offer for travel insurance. All of that data and interactions are integrated into messenger platforms, forums, auction sites, and online sale sites. Could European insurers learn from that? European insurers could learn from their Chinese competitors how to imitate non-linear customer journeys. In Europe, when you purchase a new TV, you might see a popup window that will ask you if you want to purchase insurance for this TV. China is a little different. You go to forums to ask people which TVs they recommend. As soon as you type it in, the words get highlighted and link you to the stores. You click on the store, and you’ll get a selection, various opinions, and reviews. You might also see an automatic reach out popup, encouraging you to talk to one of the customer representatives. You start talking, purchase a TV, and in an instant, you get an offer for Zhong An insurance products – you can insure the TV or the shipping, or purchase additional return insurance in case you want to return the TV within 30 days. This is a sort of affinity product that really doesn't exist that much in Europe. And suddenly your insurance customer journey is very different. But it is still limited to the TV set and insurance offer prepared in advance. Let's say I purchased a new refrigerator, a washing machine, and some other things. Now Zhong An see this and it triggers the flow: ok, maybe the customer moved house and bought a new apartment. So all of a sudden an agent from Zhong An contacts me the next day through a chat application with this short message ”Hello, have you moved house? Would you like to purchase home insurance?”. The customer journey is very non-linear. I think that European insurers would do exactly the same if they were not afraid of regulators. But data protection laws in China are actually quite strict as well. The difference lies in the fact that this is all done within companies that are affiliated. So Chinese regulators allow them to share data and the amount of data is staggering. What is preventing Western companies from following the Chinese path? Mikołaj Bołtuć: Well, there is a different culture, that is for sure. Western people don't spend an average of three hours a day on their cellphones. Secondly, old legacy IT systems don’t help that much in integrating the data. The customer journey I described forces the companies to have data integrated among different departments and different data sources. We've done projects without destroying legacy systems for insurers in Europe. But this is something that European insurers and European banks are just starting to do. For some, it would be possible to create these data links without major changes. For others, though, it would require heavy IT investment and the migration to newer systems. The last problem lies in the agent networks – traditional distribution networks are quite resistant to these changes. Whereas in China, with companies like Zhong An and Ant Financial that didn't exist 10 years ago, they don't have these barriers. So is it also the people on the insurers’ side, that slow down the pace? When we look at insurance agents in Europe, their average age is over 45. Many of them are worried that these digital solutions will actually lower their premiums or will destroy the network, and the distribution will become purely digital without the agents. That's not true. Look at China: the number of insurance agents actually increased in comparison to 2010. Right now, there are 1.5m agents. It's a whole army! The scale is huge, but at the same time, the role of the agent is still very much there. A lot of insurance brokers in Europe have to find customers by going door to door or going golfing with richer customers. In China, they receive so much information about the customers that it makes reaching the customer easier and keeps the role of agent central. I think that the status quo will not change for a long time. The complete automation of this process in the near future is highly unlikely. Besides, most people still like the human touch. Insurtech and fintech. A competition or partners for incumbent players? I think we need to acknowledge that fintech or insurtech companies fall into several different categories. 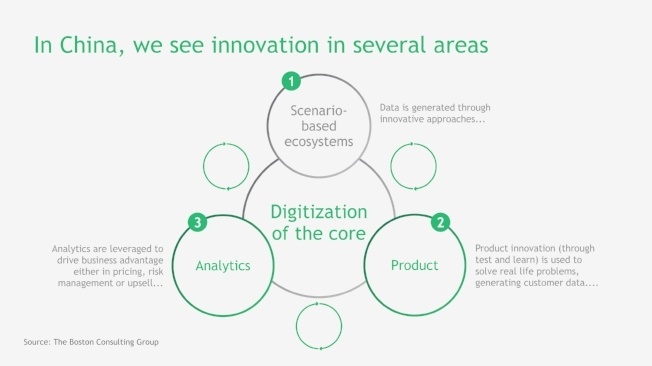 Technology and ecosystems providers are more of a boon for incumbent insurers than a form of competition. We're seeing fintechs that allow the automated assessment of damage, for example, in homes or after car accidents. There are fintechs that offer fraud detection and fintechs that distribute insurance products in new ways. These types of fintechs can be partners or acquisition targets for established players.Even the fintechs which are insurance companies, such as Lemonade, haven’t developed the scale to really be a threat. What they are doing well is that they are changing customer expectations. They're changing customer journeys to meet the actual customers’ expectations about digital services. So they're giving these large incumbents fresh, interesting ideas. But are these large incumbents listening? For sure. I’m thinking of, for instance, the German Allianz. I would say that this is one of the companies that are really at the forefront of the technology revolution in the West. They're either buying or establishing their own fintechs. And later they could leverage those either as technology providers for the company or as testing grounds for some innovative insurance sales ideas. It is happening now. Allianz might be an exception. I would say that some players still approach changes with a “wait and see” attitude. They are waiting to see what the successful customer journeys and successful solutions will be. And they don't want to invest too heavily, which is especially true for smaller or midsize players. Are they on a right path? This is a bit problematic, because there's a huge first mover advantage. 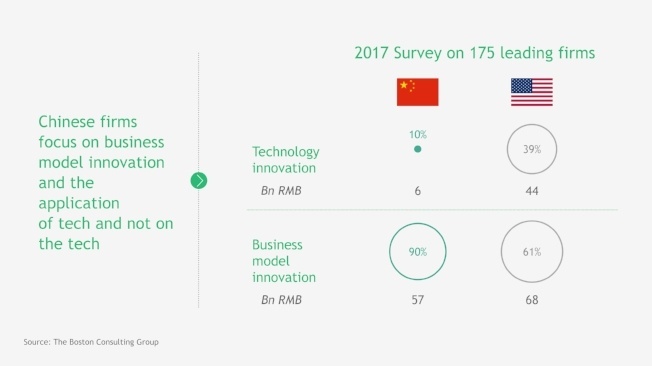 We saw this in China, where the big players that first entered the digital market in banking and insurance gained such a huge advantage with being connected to Tencent or Alibaba first that it's very difficult for those that had waited to actually regain their market position. So you would advise against going with the “wait and see” approach? I think the wait-and-see model to some extent – when you have a very small investment budget – may be smart. But you have to very quickly jump on an idea when you see that it's working. Especially for smaller and midsize companies, I would advise opportunistic investment. They need to be very opportunistic, but at the same time very hungry and ready to pounce when they see an opportunity. You are talking about smaller players. What about the largest ships? I think the largest players in Europe are a little bit different than the largest players in China in terms of their self-perception. It really comes down to the fundamental company philosophy. Ping An declared last year that they are no longer an insurance company. They are a digital company. 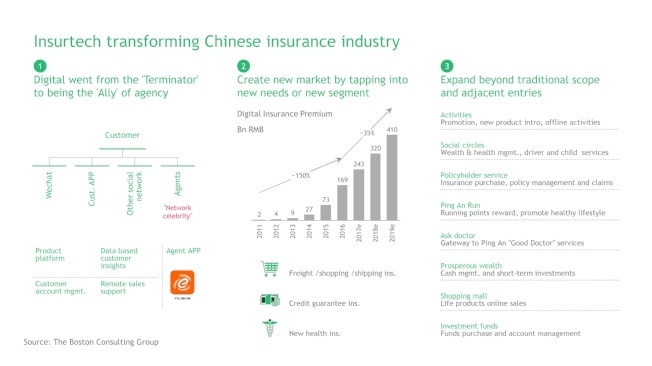 Ping An has 170 million insurance clients and they have 400 million customers in total. So who are the other 230 million customers? These are the customers that use their applications such as Good Doc, which is Ping An’s version of DocPlanner. They have health care providers, they have financial advice applications, and they're going into open banking. With regulatory innovations taking place in Europe (e.g. PSD2), there's room for insurers and banks to partner up and no longer see themselves as companies that exclusively do insurance or banking. They might reinvent themselves as data companies or maybe financial data companies. I think that's the leap that the big insurers and the big banks have to make. What if they just stay in the box? Eventually, they will be replaced by Mercedes or BMW, who are venturing into the motor insurance market. Automotive companies have all the data – new cars are equipped with telematics – and they have all the car parts in their distribution chain. So it's much easier for them to literally liquidate accidents and to provide insurance for their cars. As for banks, they might be replaced by Facebook, Amazon, or Google. With open banking, we are only one step away from Amazon Pay or Google Pay, or Facebook providing us payments services. Once they have a payment ecosystem, well, what will stop them from providing you affinity insurance for various purchases or home insurance? This is still miles away but in 20 years’ time, who knows? So the risk is that they will share the fate of telecoms? The same thing that happened to telecoms could very well happen in the banking industry. All of the value was created by over-the-top services whereas the revenues from major telecoms were essentially flat. Telecoms became providers of the infrastructure. The scenario for the financial industry is that banks will become providers of the capital. Insurers will exist, Swiss Re will do fine, they'll be reinsuring all of these other companies. But the distribution networks of traditional insurers that rely on business to customer sales will be replaced. It all relies on building an ecosystem. And it is not easy to build one without the support of the regulators. Well, regulating financial services markets will definitely be a challenge. Both on the banking side, the insurance side, and also on the side of these over-the-top and third-party providers. Providing the industry with clear and stable regulations will also be challenging. I've been reading a lot through PSD2 and I've been involved in working groups concerned the implementation of the PSD2 directive. Honestly, the regulations as they stand now are still quite unclear. Has China the answer to that? In China, a regulator will give you a green light to conduct some experiments with a business model or a technology. Then, they will wait and see. If this experiment impacts the financial market negatively, if this causes problems, your company will be arbitrarily fined and face losses. Your board of directors that approved this decision might be penalised as well. But you can do it, it's up to you – so it is basically your responsibility to self-regulate. And I think very few European regulators are bold enough to say that you can go ahead with some new thing, but you will do it at your own responsibility. In Europe, we are keen on preventing problems or disasters before they ensue, and I think that's one thing that is stifling innovation. You can't achieve growth in the region of 150 percent if you're trying to create regulations for five years forward based on solutions that existed three years ago. The world has already moved on. It's difficult to change the mindset. I can’t imagine a regulator in Europe not having second thoughts about cryptocurrency scams vanishing with people’s money. Sure, it's a very difficult balancing act that regulators have to do. But luckily, they can leverage some of the working solutions already present in Asian markets, and work hand in hand with businesses on new ones.